This 100 year old, 400 square foot store (once a barber shop) exemplifies all I love about the South. Oakleaf and Acorn, a men's store in Braselton, Georgia oozes character inside and out, equal parts history and soul. It's that, "C'mon in, i'll leave the door open for ya" feel where you leave all pressures of time and stress behind and just enjoy the experience of the shop... taking time to chat with the affable store owner, John Rich. This is a masculine space for sure but appeals to women for it's bevy of unique, well made finds, all creatively displayed. John wants you to spend some time here, and most people do. Beer, coke and ginger ale are stashed in coolers on the porch, or if you'd like something a little stronger...just ask John for a little bourbon or scotch behind his desk. It's a men's store after all. John remembers well his father's time and grandfather's time when products were handcrafted and made to last. John picks items to sell that he likes and items that you should only have to buy once that can be passed on generation to generation. Most items are local as well. 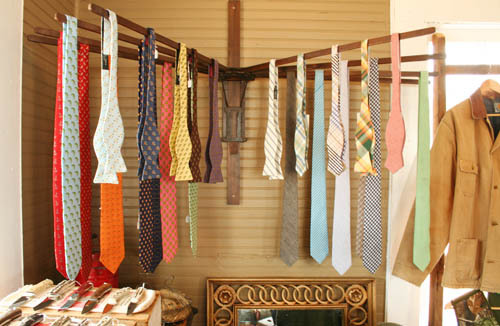 The knives come from Marvin D. Poole in Commerce, Georgia, the gorgeous frames from Shuron in Greenville, South Carolina and the uber stylish ties from Hitsman out of Oklahoma and Southern Proper in Atlanta. My personal favorite are all of John's leather items and I seriously need this green bag by Billykirk. Handmade by brothers, Chris and Kirk Bray, each leather piece is timeless in structure and design. As soon as you hold one of these leather pieces in your hands, you get the feeling that you want to take good care of it. I encourage you to watch Billykirk's well produced video here to learn more of their process.